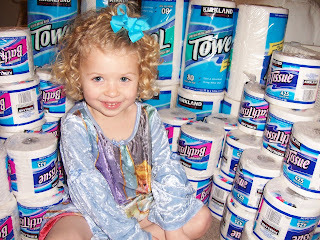 Tonight I gave Jolie 36 rolls of toilet paper, 16 rolls of paper towels, and left her to her own devices. Delighted, she spent the entire evening constructing - a throne, a castle....Here she is in her "cave." Jack (who has spent years trying to compensate for the fact that I dropped Econ 110), then explained that while we choose to shop at Costco for the benefit of bulk-quantity pricing, what Jolie is enjoying is an e x t e r n a l i t y of our decision.